The problem with shooting chic cyclists is that they are hard to catch up with. I always think about have a photo session riding a bicycle…but I never make the decission. Can you help me? Which of my styles fits better? You can watch them in my blog. I love this! He really is very stylish. So elegant and distinguished man! Is that a Lepper saddle? How very distinguished! Beautiful coat! Classic! The coat is so great! It must be funny to see you running around trying to get a snap! I never thought about running after them. I always think people would see me as a little strange. Love the first picture! Love the combination of colors! I love it! This looks like it belongs in the Vintage Photos series (which I love too). unless you are also on your bike. glad you caught him! i’m impressed his pants do not get stuck in the chain, too. And when you miss your occasion you get so upset! This is a terrific blog and always appreciate the comments but why does everyone who has an ‘opinion’ now have to shamelessly plug their own URL? It feels to me like going to a concert to enjoy the experience and having to look past a thousand i-phones which are recording the moment for posterity. Can’t humans experience something without then feeling the necessity to destroy it? Nice to see that tweeds are coming back in. Very nice series. Thx! Un matin sur la rue de Vaugirard, entre l’Odéon et le Luxembourg, n’est-ce pas? I dressed very similar to this chap and my wife asked me to change clothes. This style lokks great on him. Amazing shot and what a style this man has!!! Great! Love the coat with the yellow gloves – distinguished a n d stylish. so elegant..it reminds me of my grandpa.thats why i love these photos. The solution to catching up with chic cyclists? Be on your bike as well! Just like Bill Cunningham. nice picture!!! I like his coat!!!! The look on this man’s face in the second photo is priceless! 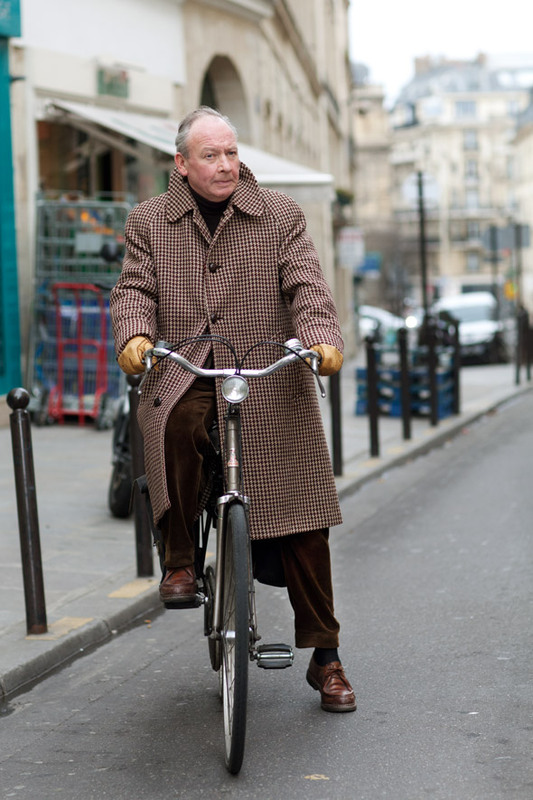 This is the most dapper bike rider I have ever seen. 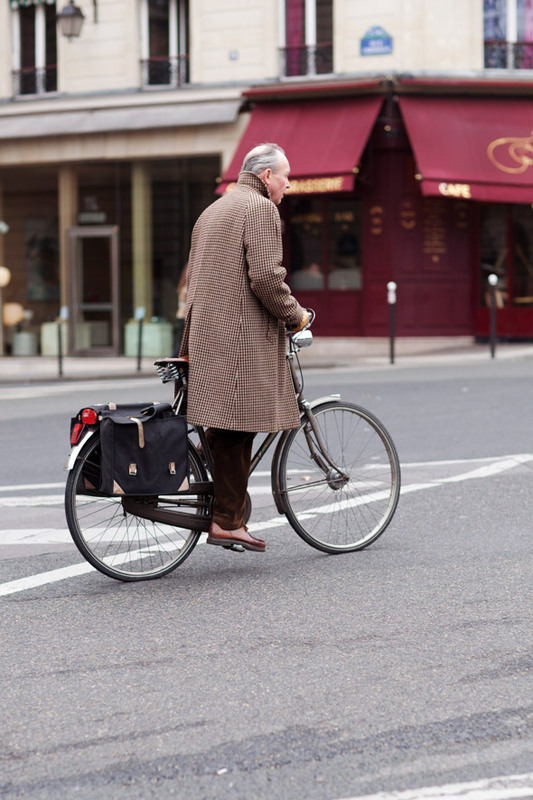 I admire cyclists who feel they don’t have to wear helmets and full cycling kit, but I suspect the roads of Paris are safer for cyclists than those of London. In a word: Elegant! Also, congrats on your CFDA award!! Well done & well deserved!! That’s funny. Especially if this one was a speedster. I like these photos so much. That is so true, so tell us the secret! BTW, elegant man. So glad you caught him. The very epitome of chic. Kudos for these great shots AND award!!! Very natty dresser…that coat is the most! @Gijs, it’s a vintage English Raleigh; chances are the saddle is an English Brooks. @Noreen, the chain is completely covered; pants can’t touch the chain. @ Jon, I hear you; a click on my name plugs other blogs. I don’t know where to begin. Too adorable for words. Well, here are some: the coat w/ the collar up and gloves are fantastic. This man is kinda giving us a lesson on simple but chic lifestyle. Amazing pic. OLD MAN WITH A BIKE, so cute! Beautiful Raleigh. I’m also a big fan of the Brooks saddles and panniers. Allez! I can just feel the crispy cold air from the first photo. I love it. I need this grandfather…=) love the style from this old man…Love second pic…great work. in this age these types of looks it is really good to see……. Beautiful vintage Raleigh bike-have a similar one myself. Love the seat, headlamp and panniers. Nice how the back vent of his coat is so functional for riding a bike. And he is dressed to perfection. Agree w/Jon re everyone’s URLs, as well. Entirely ellegant man. Great gloves! Stylish man! We love this photo. Come on Scott!!! Cyclists can wait!!! This is the big news now!!! All the best and please keep on doing what you do, and hold us up to date with style and fashion in your own special way. You and Garance deserve every bit of joy and honour coming with the award! Yes, but when you do catch up with them it’s all worth it. I love it when you post pics of well dressed men. Specially those of a certain age. It always brings a smile to my face. Reminds me of my parents, both of which I’ve never ever seen wearing jeans or shorts. Don’t get me wrong I love jeans and shorts but neither of them would even consider it. How many men out there would consider an exaggerated collar such as this? Just curious. The exaggerated plaid material with the giant collar rock. Do you think he has different colored bikes depending on his outfit? I like the bike of this elegant gentleman! Yes – both physically and in style. Excellent coat version, sure I like and buy it next season, was looking for something similar for me. I like the coat and photos, go far beyond style, was looking for something similar for me. Yes we share your problem on a daily basis! But we get the shot thankfully ! Great shots, Sart! This gent is seems vintage without seeming vintage at all. I am pretty sure he’s wearing Paraboot shoes. I bought my first pair in Paris, 1994, and I still have them. They are not only classic, but indestructible and beautifully made. I can’t decide which is cooler; The guy or the bike, but both are pretty great. Love the big, big coat with little checks. Such a chic look, love his amazing jacket. Burberry’s has stopped producing this kind of tweed coat. And the ones they are now selling doe not display the same quality at all! So this guy must be happy for having managed to grab this one before the unfortunate change! And it still looks great! He’s definitely veeeery chic! And I’ve tried shooting people riding bikes…A huge failure but I’m too optimistic to surrender! You captured some great historical brands and a unique face all togetether. Paraboots were not seen in a while in a “fashion blog”. Very handsome gentleman on the bike! He’s sharp looking and he rocks! Great, great photo. The bike is as well-dressed as he is. PS. Could the URL field in the comment box have anything to do with all the links pointing back to commenters’ blogs? what a Paraboot it is….isn’t it ? Classy all the way … the bike … a 1970′s Raleigh Sport ! He really is very stylish. Great photo! I shoot a lot of bikers and have the same problem. A lot of times the more chic they are the faster they ride! That’s real devotion, trying to catch up with French cyclists to get a clear shot. And I know where this is! The cafe pictured is the first place I ever experienced food in Paris. Sweetest memories. Seeing this photo made me jump a little bit.